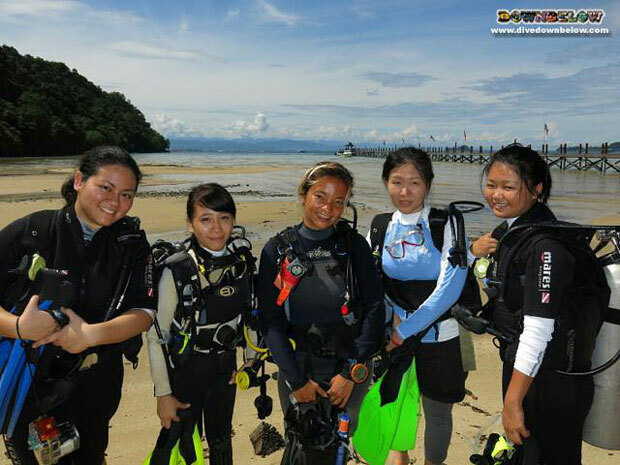 Great to see the girls from the Downbelow head office on the island for a few dives! A week ago Karen, Aby, Alice and Sarah were here. This time we welcome Mag, Joey, Ana & Stephanie to the sunny-side of the company. All of them were introduced to diving with our Discover Scuba program except for already-qualified Mag who came in for a fun dive & also to give support to her colleagues. Downbelow IDC Staff Instructor Liz Street took good care of them all throughout the day & everyone had a great day! Everyone at Downbelow loves the Ocean!